I know I’ve said this before, but this dress may be the cutest thing I’ve ever sewn. It’s made from soft sweatshirt fleece so it’s super comfy, which is always cute on little kids, but the gathers at the neck, sleeves, and pockets just make it adorable. I only wish I had something to where that was this cute and comfy at the same time! I started with the raglan t-shirt pattern I drafted a few weeks ago (check out that post to learn how to draft your own!) and made a few modifications to create this dress. This dress works great for the in-between fall weather we’re having right now (90 degrees one day and 60 the next), and will last a little longer with the addition of tights underneath. 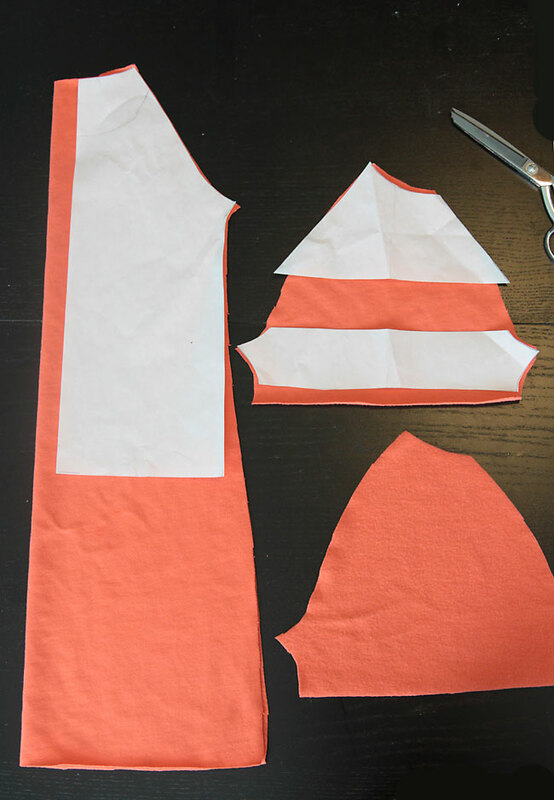 Here’s how I modified the raglan t-shirt pattern to make this dress. 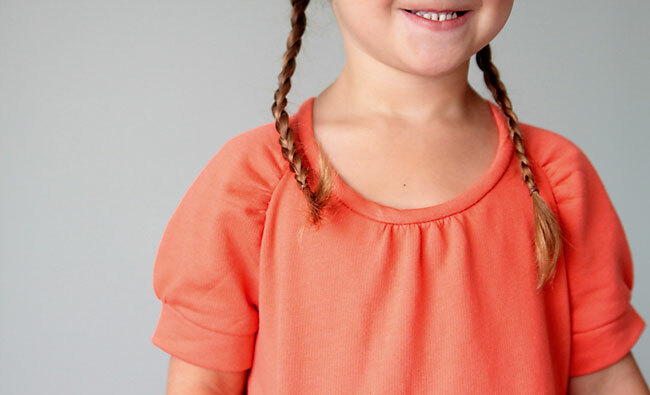 (If you don’t have a raglan tee pattern, click over to learn how to make your own – it’s easy!) 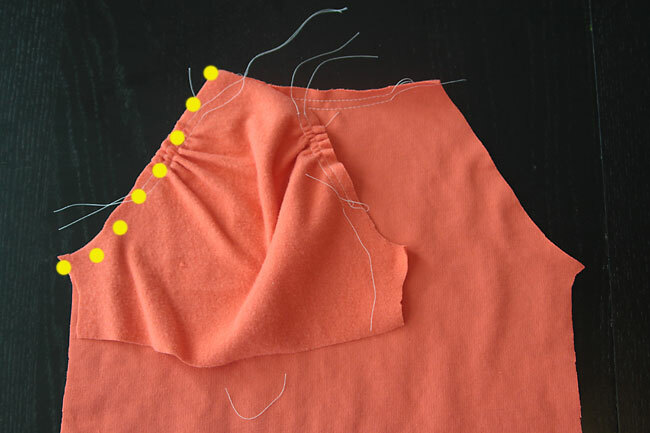 I wanted to be able to add gathers along the neckline, so I moved the main bodice piece a few inches away from the fold. I also angled it out underneath the arm for more on an A-line silhouette, and lengthened it to knee length. 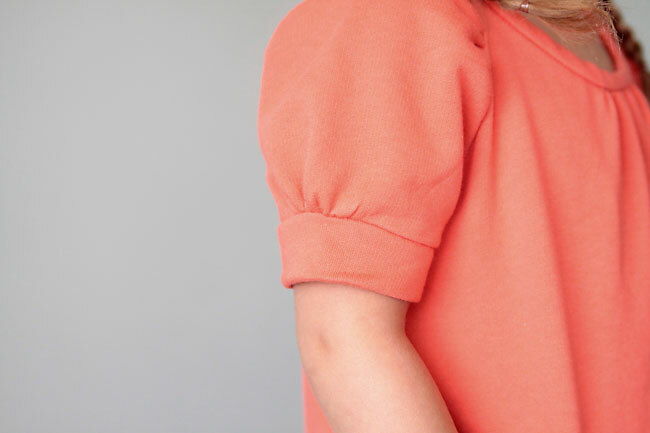 I wanted gathers in the sleeve as well, so I slashed across the sleeve pattern and spaced the two pieces a few inches apart, cutting a slight curve to connect them. Then it was time to start gathering. I sewed two rows of gathering stitches along the sides of each sleeve and pulled on the bobbin threads to gather them up. 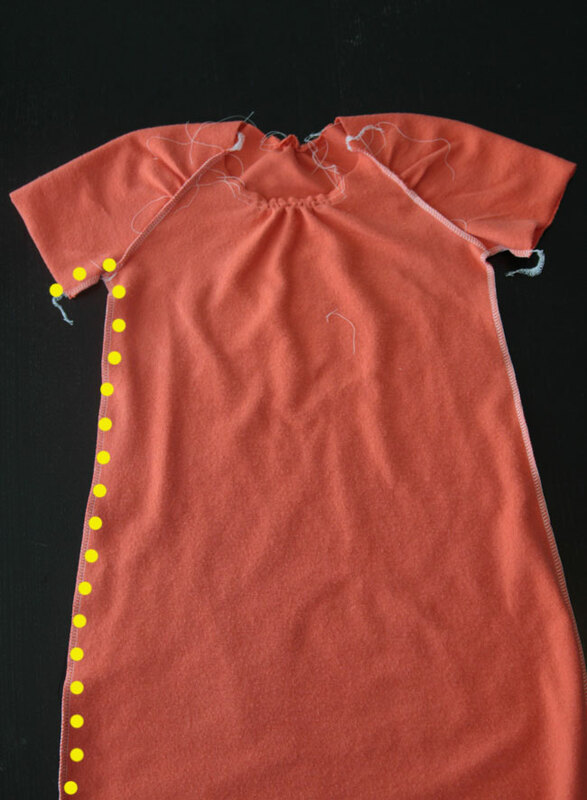 I also sewed two rows of gathering stitches along the front and back neckline, and pulled bobbin stitches to gather them up as well. Construction follows the same method I showed in my raglan tee post. 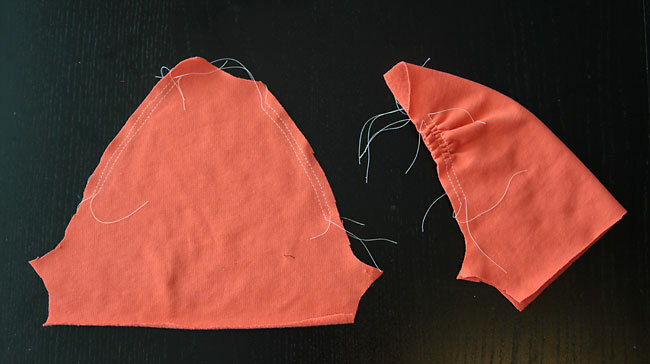 This time I just had to make sure the sleeves were gathered enough to fit the bodice piece, as shown. 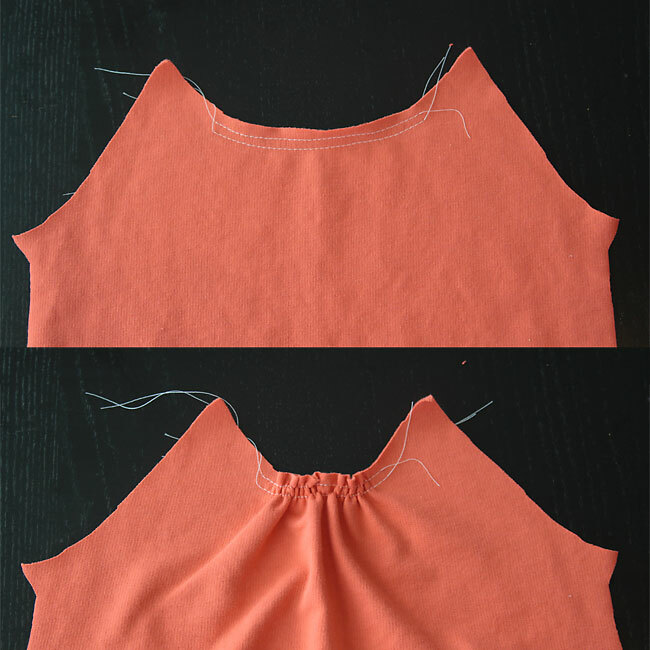 (See the raglan tee post for more details on how to attach the sleeves). Then it was time to bind the neck. Because sweatshirt fleece is not very stretchy, I had to make sure the neckline was big enough that it would fit over my daughter’s head, but not so big it would gape. That meant adjusting the gathers in the front and back before sewing on a neck binding. I finished the sleeve with a simple hem band, the same way I did in the original easy tee post. The only different was that I gathered the sleeves a bit at the bottom first. I hemmed the dress using another hem band, nice and wide this time, with a little topstitching to make it pop. And finally I added some gathered pockets. (Sorry I forgot to get step out photos for the pockets!) Basically I just cut rectangles that were slightly wider at the top (I guess that makes them trapezoids…), then gathered the top and sewed on a band. 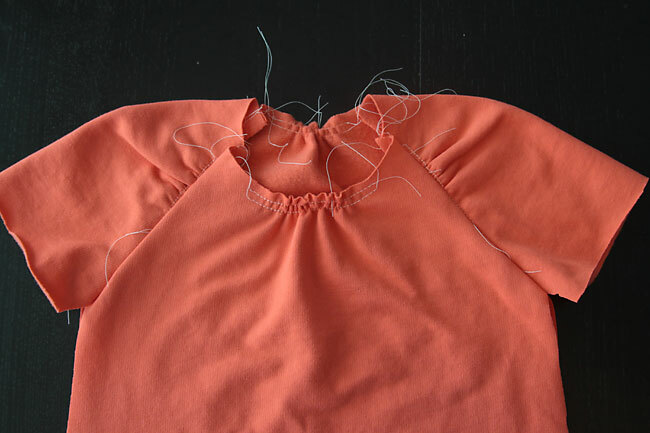 Then I pressed the sides and bottom under, and sewed the pockets to the dress. And I’m in love. The dress took me 3 hours start to finish, including a bit of a messy part in the middle when I had to unpick the neckline because I made it a smidge too big. I wasn’t sure it was going to work out, but I’m glad I stuck with it! 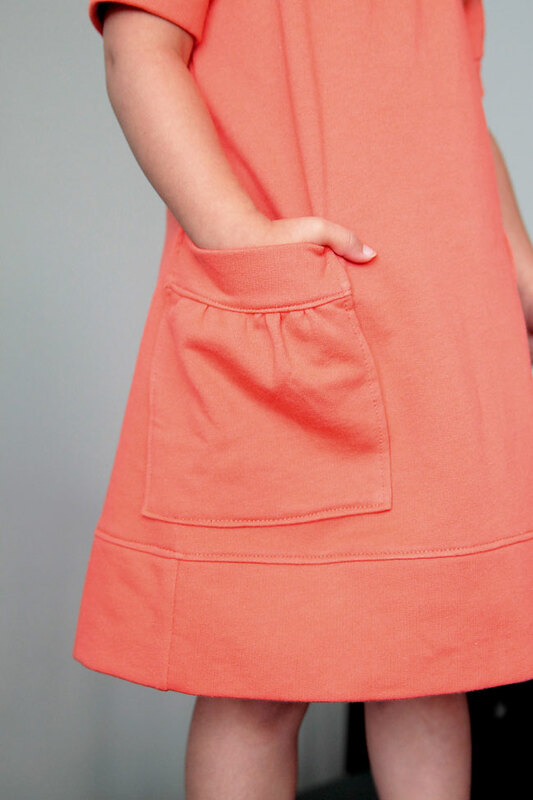 The fun coral sweatshirt fleece I used can be found here at Girl Charlee. It’s extremely soft on the inside, and comes 70 inches wide so you get a lot of fabric for the price! I had one yard and it was PLENTY – there’s enough left to make her a skirt or top. Oh my!!! 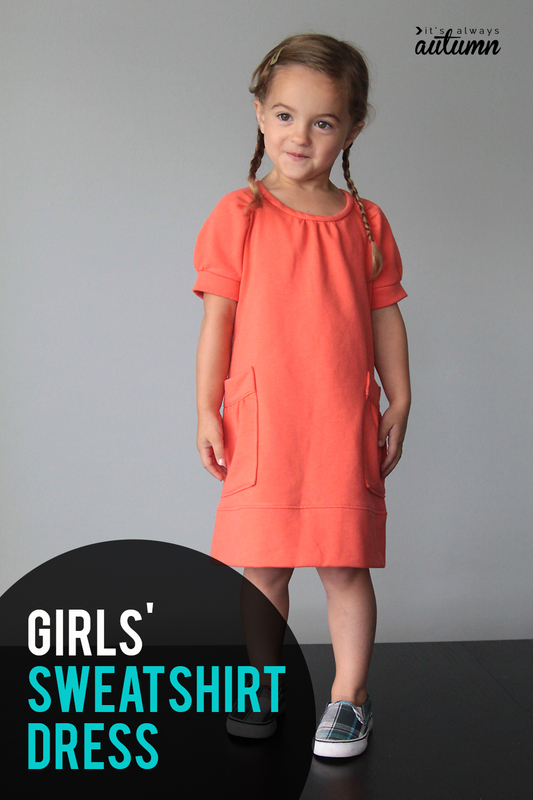 I love this little dress……my nieces would wear one of these every day of the week!! SUPER CUTE!! thanks! I’d love one for myself too! So cute love it !!!!!!! Looks so comfty !!!! I love this! Such a cute dress. And I think I will be copying it for Halloween. I have a daughter who wants to be Mavis from Hotel Transylvania. Thanks! Wonderful, easy to follow tutorial. ♥ the dress! It;s supa cute as is the model☺. Love this!!! So perfect for the lightweight sweater knits I don’t know what to so with. we have lots of the 60-90 degree weather here in phx lately too 😉 thanks for the great tutorial! I am making this dress… and it’s super cute, but I can’t quite get the neckline since the sweatshirt fleece is not very stretchy. How much did you subtract from the neckline measurement? Or, did you just make the binding and the neck opening about the same size? Thanks in advance!